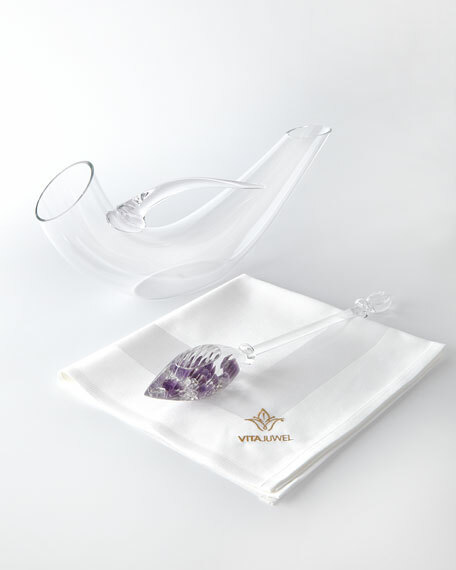 Wine lovers, you will delight in experimenting with the Gem-Water Vino Gemstone Vial and Decanter Set by VitaJuwel. Just as Gem-Water Bottles and Vials use gemstone crystals to create a 'smoothing' affect on water's mouth-feel by raising the pH and oxygen content, the Vino Vial dramatically transforms wineenhancing its natural characteristics but reducing the harshness people sometimes experience. Trying is believing! It's especially effective on a young red with a lot of tannic 'bite.' It has been said to almost provide a 'window' into how a wine will develop over time. Handcrafted set includes one Gemstone Vial and one wine decanter. Amethyst, garnet, and clear quartz gem blend softens the tannic "bite" of most wines especially a young red. The Gem-Water VINO Gemstone Vial by VitaJuwel does so via its special blend of amethyst gemstones inside the bell of the hand blown vial. For millennia, amethysts have been known to improve wine, but submerging gems in wine has simply been impractical until now. This elegant system is both an effective and hygienic way to carry on an ancient practice. 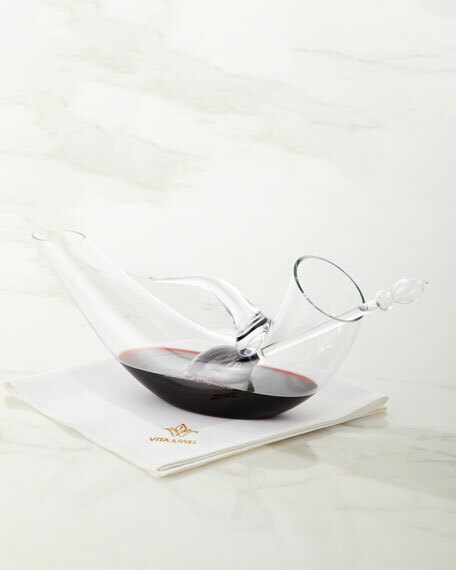 To enhance the experience, we even created a uniquely shaped wine decanter. Handcrafted in Europe, it is an exquisite masterpiece. Fill it with a bottle of wine, insert the VINO Vial, wait 7-10 minutes, and pour yourself and your friends a glass. The pair make a great addition to your collection of wine accessories and a fantastically creative gift for your fellow wine enthusiasts. Made of lead-free hand-blown glass; fair mined gems. 20"W x 5"D x 5"T.